Research inconclusive. Copyright may apply. In the early 1920s, the photographer Paul Strand proposed a film project to Charles Sheeler (his collaborator on the 1920 film Manhatta) involving the New York Yacht Club. Never a sportsman, Sheeler may have studied the sailboats at the yacht club in anticipation of this never-realized film. One of several works on this subject, the Cubist-inspired Pertaining to Yachts and Yachting eloquently suggests the swift movement of several large vessels in the ocean, giving the viewer what one scholar called a "full yachting experience." Charles Sheeler, perhaps the best-known proponent of the movement in early twentieth-century American art known as Precisionism, strove to reduce his compositions to the brink of abstraction, retaining only the details that were necessary to preserve the intelligibility of his subject. 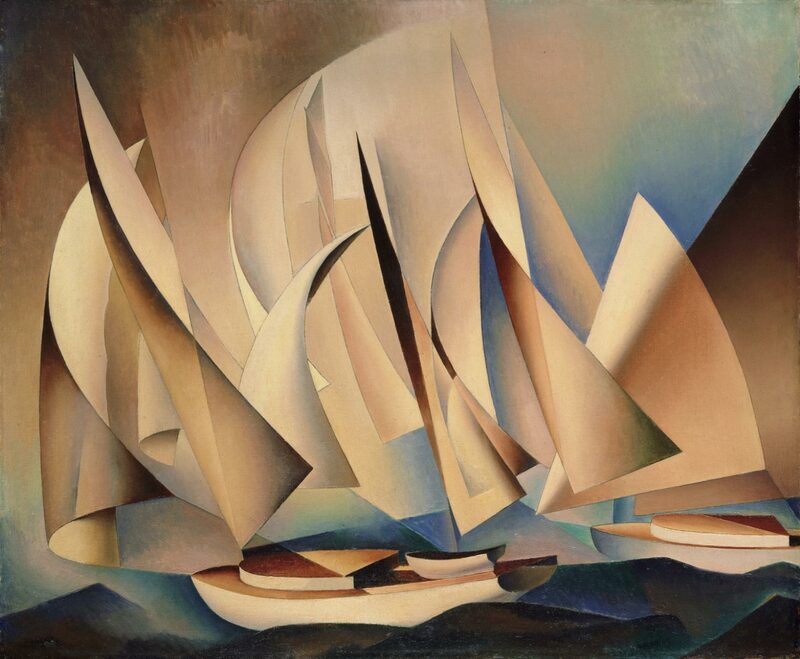 Exhibited in his 1939 solo exhibition at the Museum of Modern Art, New York, this work, with its crisp lines and smoothly rendered planar forms, powerfully unveils the essential elements of yachting: boats, sails, water, and sky. Although some scholars posit that the artist relied entirely on books and photographs to create this work, his knowledge of nautical subjects may have developed from firsthand experience. In the early 1920s, the photographer Paul Strand proposed a film project to Sheeler (his collaborator on the 1920 film Manhatta) involving the New York Yacht Club. By no means a sportsman himself, Sheeler may have studied the boats at the yacht club in anticipation of this never-realized film. Regardless of the initial inspiration for Pertaining to Yachts and Yachting, Sheeler must have admired this theme, as he would return again to this subject over twenty years later in at least three works depicting sailboats, such as Wings II (1949; National Gallery of Canada, Ottawa). Melissa Kerr, from Masterpieces from the Philadelphia Museum of Art: Impressionism and Modern Art (2007), p. 200.